Confession time: Though I have been running/walking at least a couple days each week I’ve somehow fallen off the triathlon wagon. I haven’t been in the ocean or even a pool once this year and I’ve ridden my bike once (though that one time was a 50 miler). If you’re thinking, “Why would you swim now? It’s freezing cold and there’s still snow on the ground!” then you’re probably not anywhere near Southern California. In LA yesterday it was quite hot with high temperatures in the 90s. To change all this, over the next two weeks or so I’ll be doing a moderate distance bike ride, participating in the WordPress 5K, and taking on my first Masters SCAQ swim workshop. The swim workout is the same day as the official 5k run, April 10, so I will likely do my 5k run between April 4-9… although I probably could run on April 10 too if I really wanted to. That is how we triathletes roll! 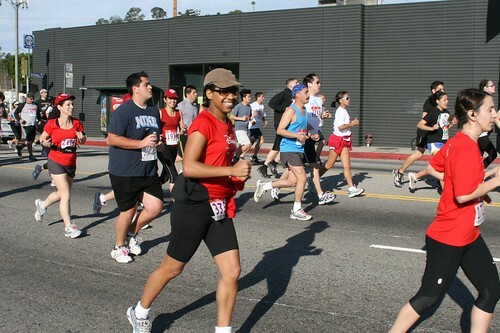 Tomorrow is the LA Marathon. It’s supposed to rain at some point. A point at which the forecasters haven’t been able to reliably predict to save their lives. Oh well. I’m going to head to the Hills of Beverly to volunteer at a water station after a few hours of sleep first. It’ll be my first time attending a marathon. In the past I’ve intentionally stayed away from the general area and felt bad for the people not participating but who got caught in the resulting street closure traffic anyway. Since I’ve been running, that disinterest has waned. Rather, the interest grew. I’m excited now to see what a race that long is like. I knew I wasn’t psychologically ready to sign up for this marathon a few months ago but a few good friends of mine were and did so. This is an amazing feat not to be entered into lightly and I was in full support of their decision to train and essentially drop out of my life for the most part, except for digital communication. The best part about tomorrow is that I will be able to share in the joys of their goal accomplishment and live vicariously through them for an experience that there’s actually still time and other opportunities for me to do if I choose. The worst part is that I’m sure to lose my voice by 10am from all the yelling for the runners and maybe get rained on for hours. Last year I would not have entertained the thought of running in one. Me, run a marathon within the next couple of years? You = cray cray. But things happen, and people change. This year if asked if I’d run one, I may simply shrug and give a definite, “We’ll see.” I know that all it takes is for me to just start running. And coincidentally, I already do that now. Yes, it’s hard and frustrating at the beginning but that’s what makes crossing the finish line of any ambitious goal so great. Eventually it gets easier to run further and at some point you will realize the finish line is attainable and within a reasonable time frame. I pulled off a 10k last month and am now signed up for a half-marathon (with plenty of time to train). There’s nowhere to go but up now. My perspective next year might actually be from the point of view of a participant, where I’ll be up even later than I am now trying to force my brain to shut off and go to sleep long enough to get at least 4 solid hours. We’ll see. Best efforts to anyone and everyone participating in tomorrow’s ~26.2 miler. You show me how it’s done and I’ll hand you some refreshment and a kind word to help you on your way. It all started with a step, followed quickly by another. A few hundred feet later I stopped shuffling amongst the crowd of runners and starting running as the density of people around me decreased. Together we sounded like rain as we stormed through LA’s Chinatown toward Echo Park. It was brutal running up that first hill. When running distance races it takes me about a mile or a mile and half from a dead start to catch my second wind and settle into a good pace. The first hill started between the 1/4 – 1/2 mark into my first mile and then gave me a shellacking the whole way up. I didn’t look around at the highly-touted “180 degree views of the city” because I was focused on getting to the top of that monstrous hill. That there were hundreds of other runners who felt my pain at the same time made it slightly better. At some point I saw and made a beeline for the first water station. After swigging a couple of ounces, I felt a lot better, at least until the next station was in sight. Then it was like the one before never existed. I wasn’t really in much of a race mode while going uphill. I took that to mean I was halfway through with mile 5, which meant that it was the furthest I’d ever run in one session. I still felt good so I picked up the pace and finished the race, looking for anyone standing beyond the finish line who was offering water to the finishers, naturally. They had no water at the finish line, but they did have finisher medals. I had one placed around my neck by a volunteer and obliged a request to take my timing chip off of my shoe. After that I walked about 20 meters away and found that they not only had water, but also cardboard boxes full of the juiciest orange slices and a fortune cookie. That was worth the price of admission. I grabbed some post race nutrition and hung with some teammates for awhile before grabbing a food truck meal and heading home. I’ll file away for next time the experiential knowledge that I really wouldn’t mind carrying a bottle of water with me which would eliminate the need to stop at four water stations in a 6.33 mile race. My first 10k race went well overall. I had a goal of finishing in under an hour. I clocked in at 1:04. Granted, this race was slightly longer (at 10.7k or 6.33 miles), but I now have a concrete time to try to beat for the next attempt. This is the longest running race I’ve done. If you’ve run a race before, what is the longest race you’ve done? 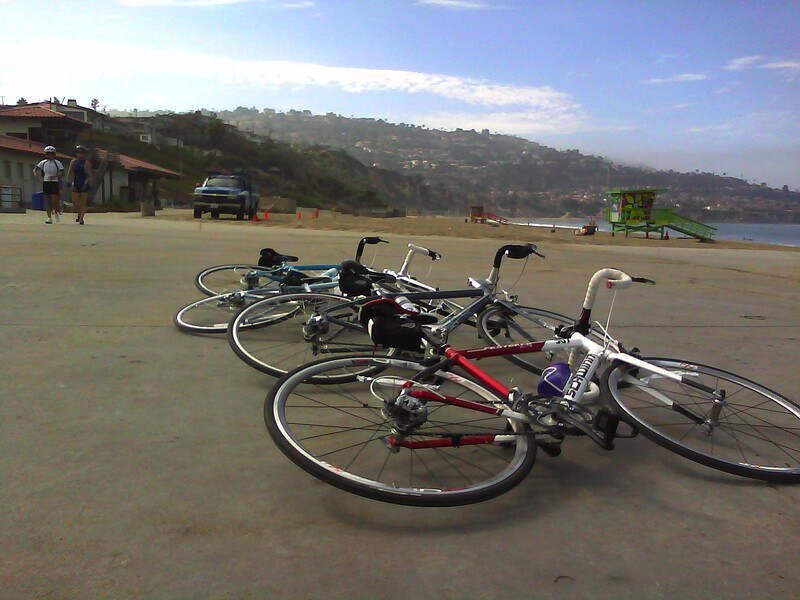 Over the last few weekends I’ve been training for the Santa Catalina Triathlon, mostly on weekends. I may try a local reverse tri before then, but I haven’t yet registered for that one. Last weekend included two days of ocean swimming but this week has been too rainy for the water quality to be good for swimmers. Today’s workout consisted of a 13 mile hilly ride followed by a 2 mile run in Palos Verdes (PV). In my training I’ve learned a few things. 1) A painted solid white line 4 feet out from a gutter half-filled with brush and other debris does not a bike lane make. And why did the city paint “bike lane” in huge raised letters within the lane? Those don’t feel good to ride over and there are enough hazards in the bike lane already (more info on bicyclinginfo.org). 2a) Hawthorne Blvd in Palos Verdes is a beast with that long double hill to climb. b) A BEAST, I say. 3) When running a hilly route for the first time think twice about picking a route with three flights of stairs. Whatever doesn’t kill you makes you stronger, right? 4) A “healthy” breakfast burrito never tasted so good than after a brick workout. 5) Recovery naps are the best. Oh, yes.